Complete your high school education, regardless of your educational system in the world, e.g. Ontario Grade 12, US Grade 12, GCE/GCSE at the A/AS level, CAPE, IB, etc. You cannot enter Canadian law schools directly from high school. After finishing high school, continue on to higher education (post-secondary) studies. Any university degree is good preparation for law school, e.g. BA, BSc, BBA, BComm, BEng. BMus, BPHE, BKin etc. There are people at U of T law school who have degrees in engineering, biochemistry, English literature, political science, economics, music etc. For your initial undergraduate degree, select the program that you will enjoy studying, since no subject is better than another for getting into law school. You are not obligated to obtain your initial undergraduate degree at the university where the law school is located, is is better to choose the institution that is the best fit for you for your initial degree. If you wish to consider obtaining the initial undergraduate degree at the University of Toronto, then please visit the undergraduate admissions webpage, and direct all undergraduate admissions inquiries to the undergraduate admissions office. Undergraduate degrees are typically designed to be completed in four years of full-time studies. In order to qualify to be accepted into law school, most law schools in Canada require the completion of at least three years of your degree or a completed degree. Even if the law school you are applying to does not require it, your application will be more competitive if you have completed your undergraduate degree. At the University of Toronto almost all law students have completed at least a four-year degree. In recent years, approximately five very exceptional applicants a year have been admitted without completing a four-year undergraduate degree. Degrees from accredited, recognized higher education institutions across the world are generally eligible. Consult the desired law schools to be certain. Nearly all Canadian and US law schools require the standard LSAT. The standard LSAT is held in many countries throughout the world. Not valid are the specially-designed LSAT for entry in to law schools located in India, and the specially-designed Spanish-language LSAT for law schools located in Puerto Rico. The test is held up to six times a year (July, September, November, January, March and June). The LSAT consists of several sections of questions and problems designed to test reading comprehension and your ability to think logically and analytically. It does not test factual information on any subject area, including law, therefore it does not rely on what subject(s) you study in school to do well on the LSAT. You may write the test more than one time. However, you should check with each law school to see how they treat multiple writings of the test. Some law schools average the scores and others take the highest or the lowest score. For convenience, many applicants tend to write the test in June or July after third year or during first term of their fourth year undergraduate degree, since there are usually the least conflicts with their school schedules. For high-potential undergrad students who have limited financial resources, the U of T Faculty of Law offers a free LSAT prep course plus law school admissions support. There are 17 common law schools in Canada, seven of which are in Ontario, and hundreds more in the US and around the world. When picking a law school, you will consider many things, including the size of the school, its distance from your home, the type of law it specializes in, the composition of the student body and faculty, whether it offers courses or a degree in French, and the philosophy of the school. In particular, you must also consider whether you are likely to gain admission to that particular school, based on your grades, LSAT score, and other accomplishments and attributes. There are special programs offered by different law schools as well. For example, at the U of T law school, you can do "combined" degrees in Law and Social Work or Law and Business Administration. Find out more about Admissions at the University of Toronto Faculty of Law. All law school applications in Ontario are coordinated by the Ontario Law School Application Service. The OLSAS application is completed on-line. The applications are processed by OLSAS and then forwarded to each law school the applicant has applied to for an admission decision. Every law school has different requirements for entrance. However, they all require your academic transcripts, LSAT score and some form of a personal statement. Many law schools also request reference letters. The deadline for applying to law schools in Ontario is usually the first week of November of the year before you want to enter law school. Law schools outside Ontario all have different deadlines. In Canada, the first-level law degree (e.g. JD) takes three years to complete. The first year of law school is similar at most Canadian law schools. Students take introductory courses in areas such as Criminal Law, Constitutional Law, Property Law, and Contracts Law. There are also special courses designed to teach first year students about other, exciting areas of law. In addition, first year law students are given specialized training in legal research and writing. There are many extracurricular activities and volunteer experiences open to first year students. Many students participate in trial advocacy and client counselling competitions, volunteer at legal clinics or non-profit organizations, and participate in student-led clubs and social events at the law school. This is a great way to meet people with similar interests and find out how you can apply your legal training outside of academics. A small number of students get summer jobs in the legal field after first year. For example, students may work at a Legal Aid Clinic, or may do research for a professor. Most students take jobs outside the legal field, but continue to do volunteer work to gain legal experience. During second year, there are many opportunities to pick your own courses based on your areas of interest. In either first year or the upper years of the law program, most law schools also require students to participate in a "moot" which is a mock trial, in which students act as "lawyers" on a fictional case and are "judged" by professors and lawyers. Many students work in law firms, government legal departments or legal clinics doing legal research after their second year of law school. It is a good way to learn about different legal employers, and to decide what type of law, if any, that you want to practice. During the summer, students apply for articling positions and go through articling interviews. This is your last year of law school, and it is the year in which you can really get involved in a leadership role in clubs, committees, journals or other extracurricular opportunities at the law school. Students take more specialized courses, and work on lengthy research papers in their areas of interest. Students may also participate in exchange programs. For example, U of T law school offers exchanges with many universities around the world. There are exchanges to the West Indies, Singapore, Australia to name just a few. Articling is the last phase of your formal legal education and occurs prior to being licensed to practice law. In Ontario, “articling” entails working under the supervision of a licensed (and qualified) lawyer for ten months. Articling is an excellent way to gain exposure to different areas of law before actually becoming licensed to practice. Licensing candidates can complete their “articles” in private practice (with a sole practitioner or firm of any size), with a Government office, legal clinic, or with an in-house legal department. In Ontario, articles can be completed on a full or part-time basis, split between one or more employers, and completed anywhere in Canada or abroad. Candidates can also elect to "clerk" for a judge to fulfill the articling requirement. In Ontario, licensing candidates may choose to either article or complete the Law Society of Ontario’s Law Practice Program (LPP) in order to satisfy the experiential training component of the Lawyer Licensing Process. The LPP consists of a four-month training course and a four-month work placement. Both the training course and work placement must be completed by candidates who select the LPP experiential training path. The program runs from late August/early September until the end of April. The English language program is offered by Ryerson University and the French program by the University of Ottawa. In Ontario, licensing candidates are admitted to the “bar” after successfully writing the Barrister and Solicitor examinations, which are administered by the Law Society of Ontario and offered three times per year (November, March and June). Both examinations are self-study and approximately seven (7) hours in length. The Barrister Examination assesses knowledge of the law in the following practice areas: public law, criminal procedure, family law and civil litigation. The Solicitor Examination assesses knowledge of the law in real estate, business law, wills, trusts and estate administration and planning. Both examinations assess a candidate's knowledge of their ethical and professional responsibilities and ability to establish and maintain the lawyer-client relationship. 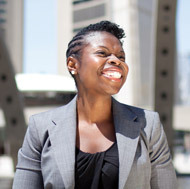 Working in the public interest may involve working for a public interest group such as the African Canadian Legal Clinic, or the Women's Legal and Education Action Fund, or doing legal aid work at a legal aid clinic, like the Metropolitan Toronto Chinese and Southeast Asian Legal Clinic. Working in private practice means that you have individual clients, which may be people or corporations. This may involve working at a big firm (over 100 lawyers) or a small law firm. Lawyers often specialize in one area of the law, for example, family law, criminal defence law, corporate law, environmental law. Others, however, have full service practices, in which they specialize and offer services in several practice areas. Working for the government means that the government itself is your client. This may involve working as a Crown Attorney prosecuting criminals or working for a ministry such as the Ministry of Health or the Ministry of Labour. Law school will provide you with an unparalleled education. Upon completion of your degree, you will be equipped with the skills and knowledge necessary to commence your career as a lawyer, but also equipped with the intellectual strength and roster of skills necessary to succeed in virtually any profession or job, including in business, politics, journalism, and virtually any other profession that requires strong oral and written communication skills, an ability to approach tasks in a clear, reasoned and logical way, and an ability to think through and effectively solve problems. Lawyers become professors, politicians, CEOs, mediators, arbitrators, union leaders, agents, doctors, teachers, and so much more. Getting a law degree is one of the best educations you can get; the possibilities are endless! Read an article on non-practicing lawyers by Canada's National Post newspaper. Prepared by the Career Development Office and the JD Admissions Office, Faculty of Law, University of Toronto. Find out more about Renatta Austin's path to law school. The University of Toronto Faculty of Law offers several programs for high school and undergraduate students who are interested in pursuing a career in law. 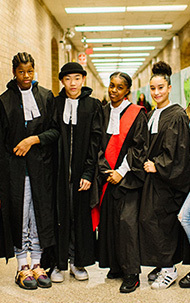 The LAWS program is a law and justice-themed high school program that targets students at six Toronto high schools who face barriers to achieving their full potential. The Aboriginal Youth Summer Program (AYSP) is offered by the U of T Faculty of Law for Aboriginal high school students who are interested in the study of law. Selected students will spend a week living on-campus at U of T and learn about various aspects of the study of law, and how they intertwine with issues affecting Aboriginal Peoples. This exciting and unique one-week summer program gives high school students an extraordinary glimpse into the reality of criminal law. Participants step into the shoes of a criminal lawyer and learn what it is like to be a student at Canada’s most prestigious law school. The annual "See Yourself Here" open house serves as a forum for students from under-represented communities who aspire to enter law school to learn more about the law school admission process and the legal profession. The Law School Access Program for low-income undergrads and recent graduates offers LSAT preparation, advice and support for eligible undergraduates and recent graduates who are considering law school. U of T Law hosts a one-day conference for currently enrolled Black undergraduate students at ANY university to provide participants with information and different viewpoints to help them make an informed decision about being a lawyer, how to get into law school, and how to thrive when they are there.